Yeah! 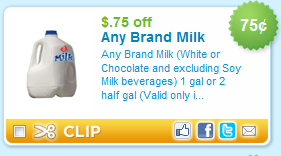 If you live in Utah or Idaho, the $0.75 off any brand milk, one gallon, and the $1.00 off any brand cheese, 2 lbs. or larger, coupons have reset! Print them off twice. Over the years, I’ve saved a lot of money on milk and cheese with these coupons because I print them off each time they are available. Make sure to share this with family and friends so they can save too.